If you haven't ordered your Christmas cards or gifts yet, it's not too late! Check out the sitewide sale on Tiny Prints going on right now -- 30% off everything, from the fun to the aesthetic. It's the best remaining sitewide sale of the season, so don't miss it. When you go to Tiny Prints and place your order, just use the promo code SW30SALE and you'll save 30% on your purchase. Terms: Offer expires 12/14/2014 (11:59 P.M. PT). Save 30% off all orders sing the code SW30SALE at checkout. This promotion code cannot be combined with other offers. Offer is not applicable to previously placed orders, shipping, taxes, rush processing charges, calendars, photo books, gift certificates, personalized postage stamps and Erin Condren weekly planners. 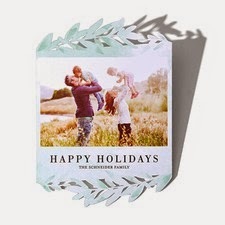 Offer is only valid on Tinyprints.com and is not applicable on third party or partner websites. To prevent fraud or abuse, we reserve the right to discontinue or modify this offer or cancel any order.